Immunogen: Synthetic peptide corresponding to a portion of human Akt. The sequence is completely conserved in rat and bovine. Scientific Background: The Akt (PKB) family of protein kinases are serine/threonine kinases, with three mammalian family members identified (Akt1, Akt2, Akt3). Akt is a well-characterized member of PI3 kinase-mediated signaling pathways, regulating cell growth, apoptosis, glycogen synthesis, and other cellular responses through its phosphorylation of downstream substrates. Akt activation is triggered by binding of phospholipid and phosphorylation at two key residues: Thr308 by PDK1, and Ser473 by PDK2, now identified as mTOR. Deregulation of Akt signaling has been associated with cancer, diabetes, and schizophrenia. Akt1 is the cellular homologue of the murine thymoma retroviral oncogene v-akt, and its role in anti-apoptotic and pro-mitotic pathways have made Akt a molecular target for anti-cancer therapeutic intervention. 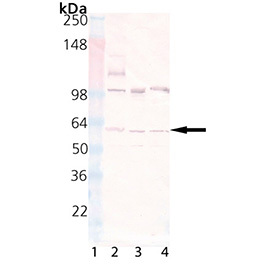 Akt activation inhibits apoptosis by phosphorylating the Bcl-2 related protein Bad, and increases p53 degradation by phosphorylating mdm2. Mitotic substrates of Akt include GSK-3β, p21CIP1, and p27KIP1, cell cycle inhibitors negatively regulated by Akt phosphorylation. Akt has been shown to mediate angiogenesis through regulation of thrombospondins, which may cooperate with pro-mitotic and anti-apoptotic functions of Akt to promote tumorigenesis. Immunohistochemistry analysis of human heart tissue stained with Akt, pAb at 10µg/ml.